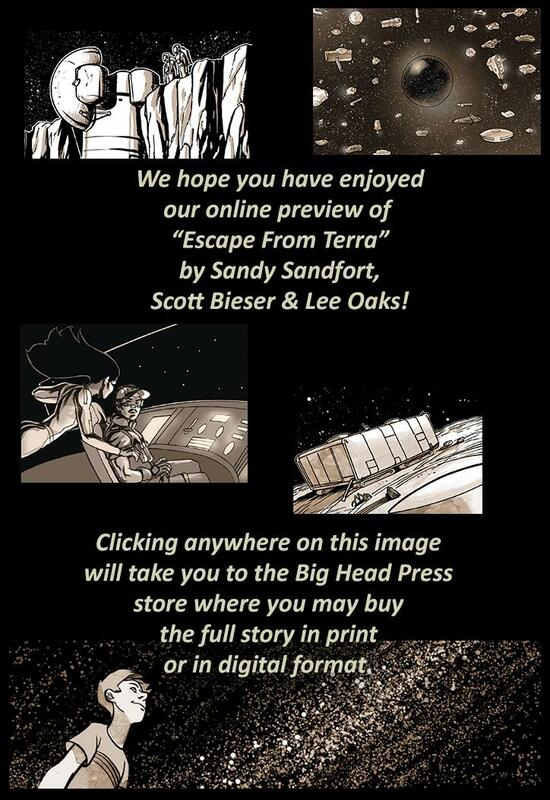 Escape From Terra is updated with new pages every Monday through Friday. SubscribeStar Update: All Systems Go! The QUANTUM VIBE page on SubscribeStar is open, although the site seems to be going through some growing pains. For that reason I'm advising Patrons looking to switch over, to wait a little while longer. I subscribed to a couple of channels there and there are some billing issues. If they get cleared up within a week, I'll announce the ALL CLEAR and invite everyone unhappy with Patreon to come over. Six adorable kids from age 4 to 10 and of mostly caucasian backgrounds thunder into a sitting room where Leon, who looks 30, sits reading the news on a holo-tablet. Molly leads the gang. Molly: Grandpa, tell us a story! Kids: Yeah! Tell us a story!! Leon sits forward in his chair looking playfully strict. We see the back of the child crowd. Medium close up of Molly, a feisty five-year-old with flaming, curly red hair and heavily freckled face. Molly: But you are old, Grandpa! Story Contents © 2008 - 2012 Sandy Sandfort, Scott Bieser, Leila Del Duca and Lee Oaks!